Make mealtime messes manageable with this roll-up silicone bib. The soft, food-safe pocket is wide enough to catch virtually any stray pieces of food that miss baby’s mouth. The bib provides ample coverage to protect baby’s clothes, and is shaped for comfort during mealtime. When you’re out and about, simply roll-up the silicone Bib which snap’s closed and tuck into a nappy bag. The silicone pocket keeps the messy bib away from the contents of the nappy bag. Washable and reusable. Quick drying. Pelican shaped so the food does not fall into the child’s lap. Ideal when out and about as it rolls-up and can be tucked into baby’s nappy bag. 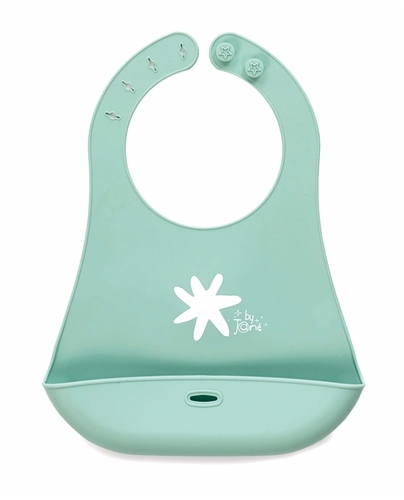 Strong neck closure keeps bib secure and is adjustable for comfort as baby grows. Soft silicone conforms to the body and is comfortable around baby's neck. The bib’s length and soft silicone design won’t interfere with the high chair tray or table. The silicone material is easy to wipe clean and 100% BPA, PVC, LEAD and phthalate free. If a specific colour is not chosen or assorted colour selected then One is picked at random and despatched.